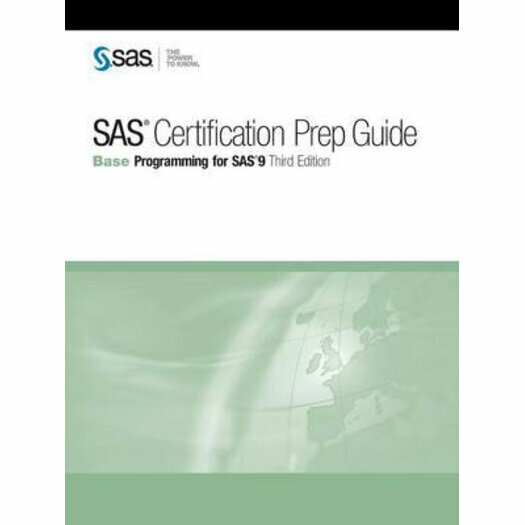 New and experienced SAS users who want to prepare for the Base Programming for SAS 9 exam will find the SAS Certification Prep Guide: Base Programming for SAS 9 to be an invaluable, convenient, and comprehensive resource that covers all of the objectives tested on the exam. Major topics include importing and exporting raw data files, creating and modifying SAS data sets, and identifying and correcting data syntax and programming logic errors. You will also become familiar with the enhancements and new functionality that are available in SAS 9. Each chapter includes a quiz on the chapter's contents. This guide provides you with a solid study resource as well as a go-to reference for your library. New and experienced SAS users who want to prepare for the Base Programming for SAS 9 exam will find the SAS Certification Prep Guide: Base Programming for SAS 9 to be an invaluable, convenient, and comprehensive resource that covers all of the objectives tested on the exam. Major topics include importing and exporting raw data files, creating and modifying SAS data sets, and identifying and correcting data syntax and programming logic errors. You will also become familiar with the enhancements and new functionality that are available in SAS 9. Each chapter includes a quiz on the chapter's contents. This guide provides you with a solid study resource as well as a go-to reference for your library.